This isn’t about discount dining. It is instead about the challenges of dining with groups. A few times a year I travel with my colleagues for out of town meetings. As staff, we have assignments that often begin before dawn and meetings that last until sundown. There is no time to leave the hotel. Except for dinner. Often one dinner is preplanned (not by me) and others are on our own. This is where I come in, leaping at the opportunity to scope out the possibilities. We are headed to Baltimore, a city which is equidistant to DC from where I live, but somehow still fairly undiscovered. Night one is with a group of twenty-six at the Greek restaurant The Black Olive in Fells Point. I haven’t planned this one, but am anxious to try the restaurant rated #4 in Baltimore magazine’s 2012 Best Restaurants list. I’m going to skip to the ending and circle back around. I’m glad that the food is so good at The Black Olive. They aren’t so adept- at least on this particular night- with handling a large group. But redemption is on the plate. It quickly becomes apparent that this is going to be a long night. We are seated at one very long table in an area off to the side of the restaurant. One server comes to the table to pour wine. She brings over one bottle at a time, pouring (slowly) and then going back for more. I really want/need a glass of wine. It’s been more than 30 minutes and we haven’t ordered. Some of us are getting antsy. Others seem happily oblivious. I wish one of them was me. Eventually someone else is sent to serve our group. We have a four course menu with limited choices, which will help move things along. I am feeling fishy: scallops for my first course, fish soup for my second course, grilled whole bronzini for my third course, and mango sorbet for dessert. More time passes and the first course arrives. I am served calamari instead of scallops. I don’t eat calamari. So as everyone else enjoys their first course, I must be content with the wine. The scallops are worth the wait. Perfectly grilled, juicy,and tender. I have scallops. I have wine. I am getting happier. 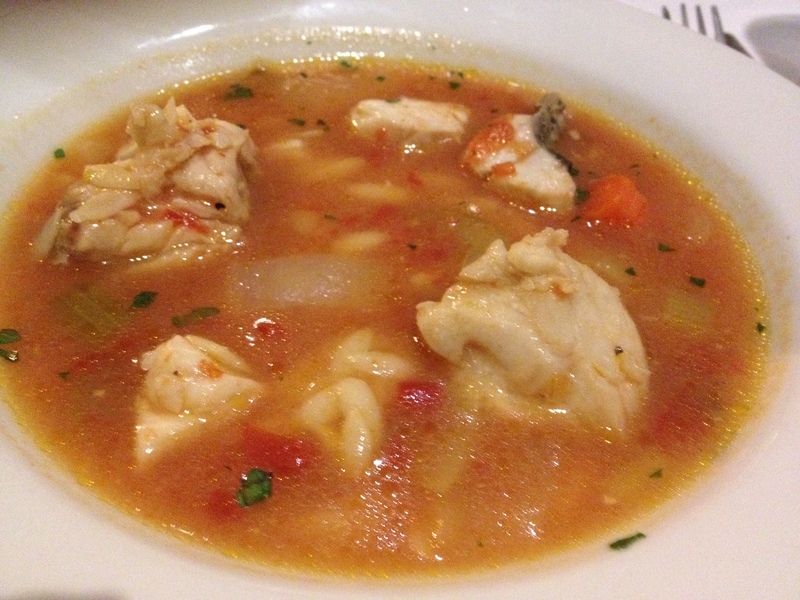 The fish soup has a nice flavor. I say yes to some additional black pepper (which is added post photo). I’ve never seen such large flakes of pepper before. They actually have me coughing and gasping a bit. This is not a bad thing. I like the soup, even though less pepper would be preferable. 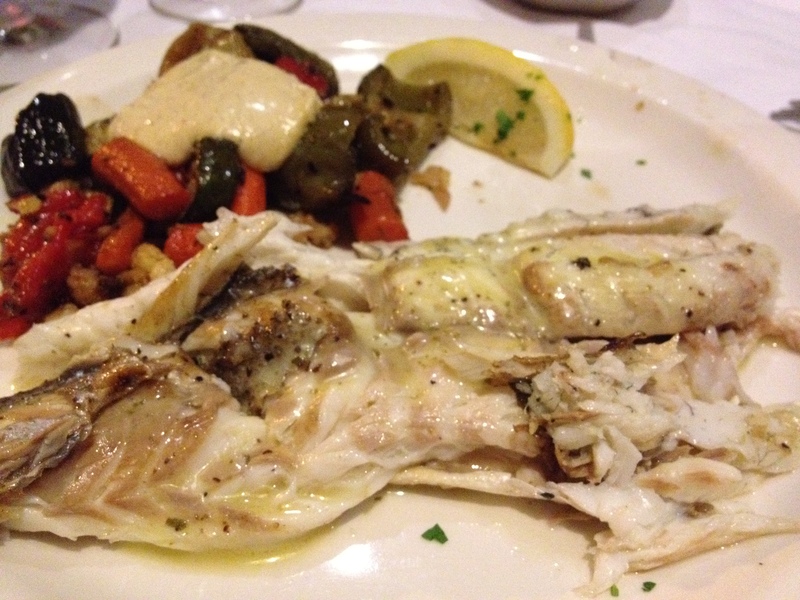 The bronzini is the star of the night. 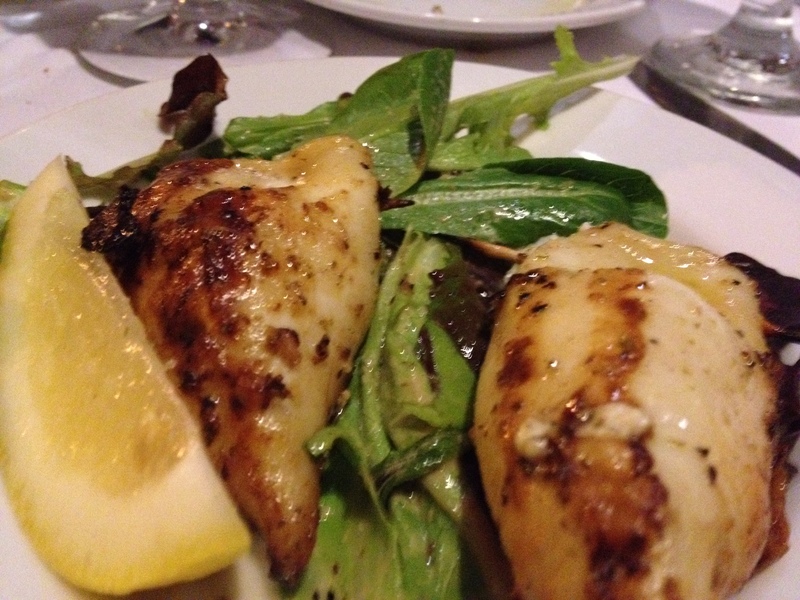 It is simply prepared – grilled with olive oil and lemon juice. The simplicity accentuates the freshness of the fish. Fish fans should hightail it to Baltimore. The accompanying vegetables are topped with a delicious garlicky sauce. Dessert is served without our coffee, which finally arrives when we’re close to being on the way out. We are a bit weary by the end of our meal at The Black Olive. It has been a long night. But somehow the beautiful simplicity of the meal makes up for some of the missteps in accommodating a large group. I am ready to go back – although with twenty or so fewer people next time. The next night I have organized a group of staff to go out to dinner at the Italian Sotto Sopra in the Mt. Vernon neighborhood. There are twelve of us. If we were feeling weary the night before, we are downright exhausted at this point. I have to twist a few arms of people who want to bail out. There is concern about another lengthy dinner. I manage – with some effort- to keep the group intact. I am trying to downplay the fact that there is a party of 50 already in the restaurant that night and they are squeezing our group in. I know that this could get ugly. There is nothing worse than angering a group of people you have to see every day of the week. We arrive at Sotto Sopra and they lead us through the large group to an area in the back. 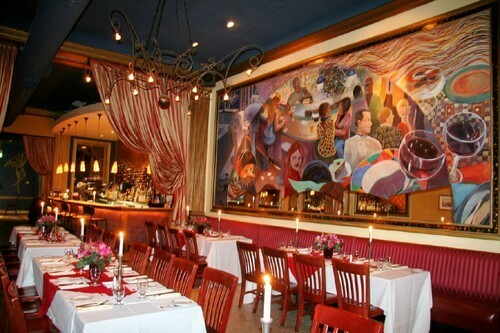 The restaurant is beautifully decorated with colorful murals on the walls. I settle into my food happy place when I see the menu. I’m delighted with the choices as is everyone at the table (even if there is some initial uncertainty about what to order.) There are only a few other tables of patrons in the restaurant aside from the large group, and they seem to be ordering at the same time. I can’t imagine how the kitchen is going to handle this. I am amazed when they do- effortlessly- at least it seems that way to us. If they are overwhelmed by serving so many people at once, they never show it. My starter is a panzanilla invernale with arugula, beets, dates, pancetta, goat cheese, and a tangerine dressing. 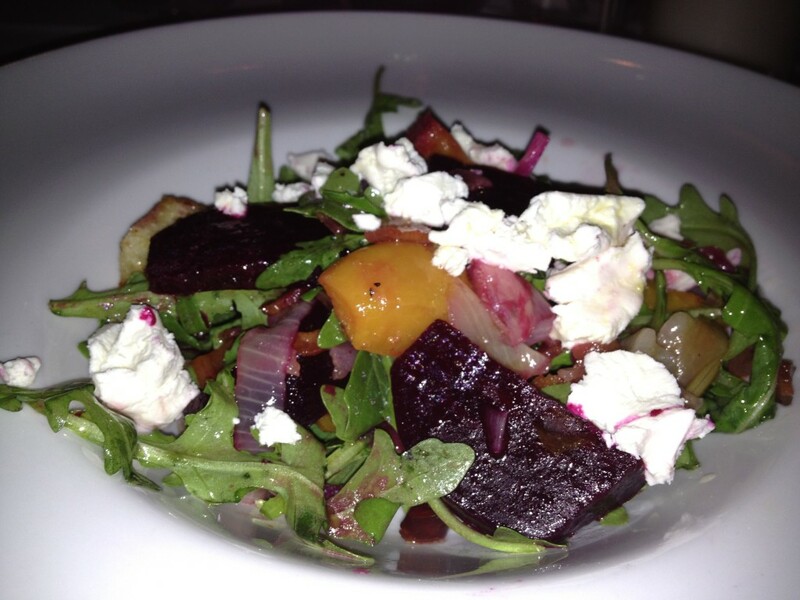 If you follow my blog regularly you may be thinking, “really, beets and goat cheese….again?” I know, I know. But I find the addition of dates and pancetta and the tangerine dressing irresistible. Sometimes you have to go with your instincts. This is a great combination of salty and sweet. I am not ashamed to say that I would order it again. 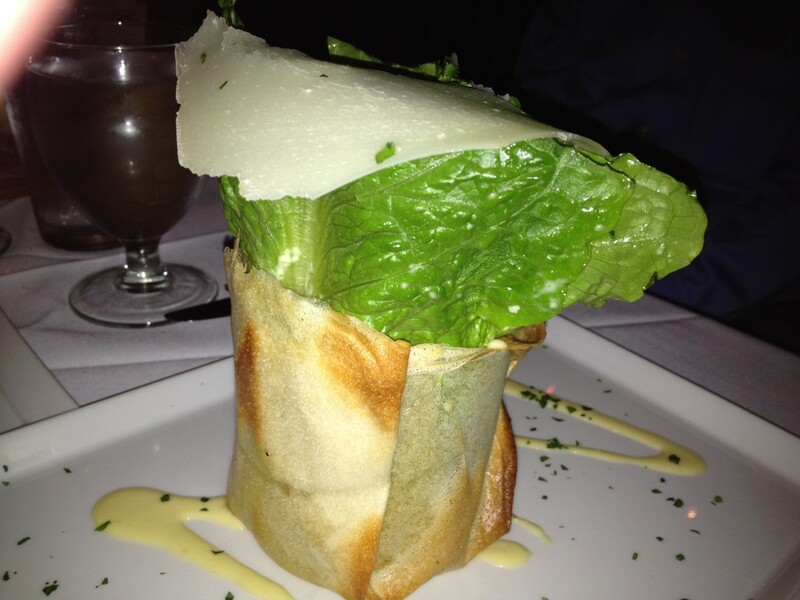 A few people have a caesar salad, which they describe as deconstructed and reinvented. They rave about the presentation and taste. I am relieved when a colleague agrees to split pasta dishes with me, as I am having trouble deciding on an entree. The first is ravioli d’aragosta with lobster, brandy shallot reduction, and fried leeks. I would have been perfectly content with this dish, but our second pasta blows me away and it’s hard to compare. 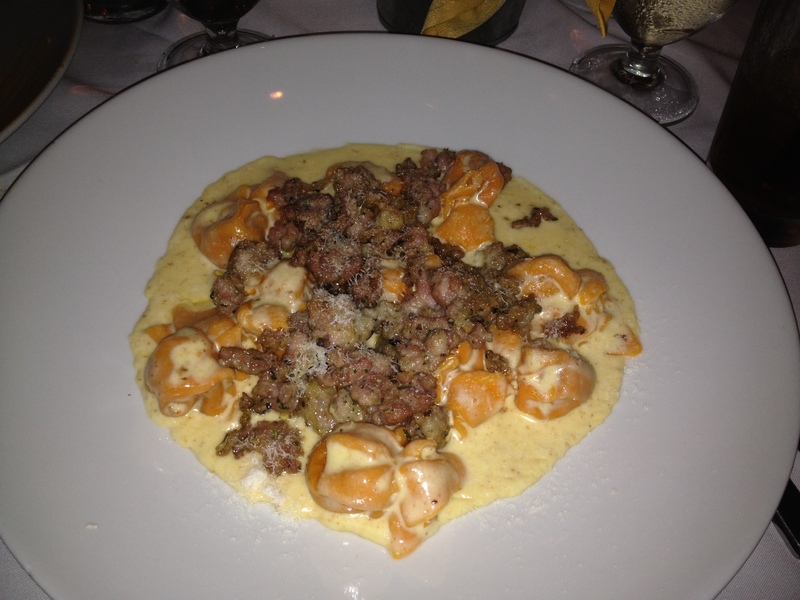 Our second pasta is sacchetti di zucca con salsiccia. Translated: pumpkin pasta with amaretto cookies, broken sausage, and cream. The combination may seem unlikely, but somehow it works. Wonderfully! This gets passed around the table and the feeling is unanimous. The dish may not look so beautiful, but trust me, it has a great personality. This is one of those dishes that I would go out of my way for- or at least all the way to Baltimore. 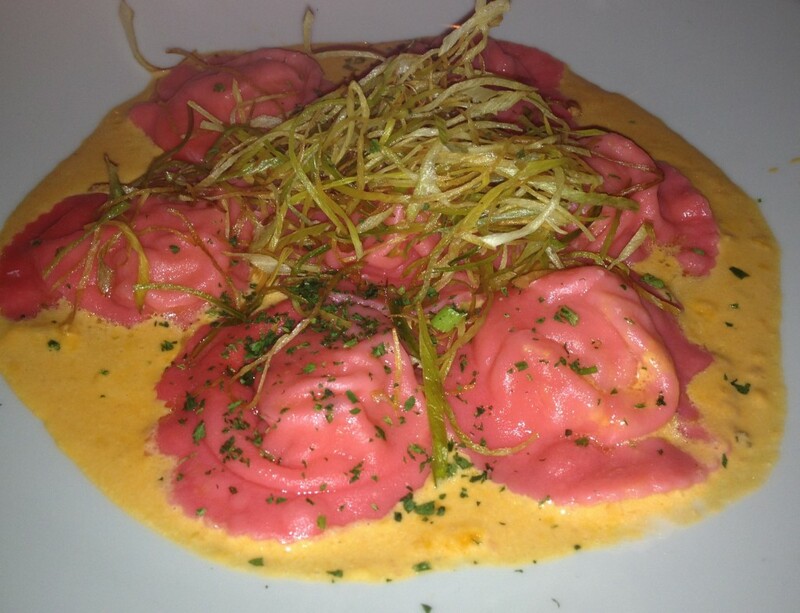 Sotto Sopra has scored a home run for our team. The service is competent and the food memorable. We couldn’t appreciate it more. We consider sharing a dessert or two, but the wishes of those who are ready to head back to the hotel drown out the voices of those who wouldn’t mind a taste of something sweet. For once I can’t say that I really mind. Sometimes tired does trump eating. Heading home from Baltimore, I reflect on the meeting and it goes without saying, the restaurants. Dining with groups can be a challenge- for the restaurant and the patrons. An experience that begins with shaky service can still end well if the food is good. A restaurant that excels at serving a group with good food and service makes a lasting impression. My discovery- I can travel north just as easily as south to find great food- with or without a group. lol about the pepper flakes. Grazie for such a nice right up on Sotto Sopra. We will soon be celebrating our 16th anniversary and it warms our heart when we can please for that is why we are here. May there be many more delicious meals ahead…we hope to see you once again. Great review, Lori. Sotto Sopra is one of my favorites in Baltimore.